Recently, in a stack of Sunday comics to scan, I came across an oddity that surprised me. 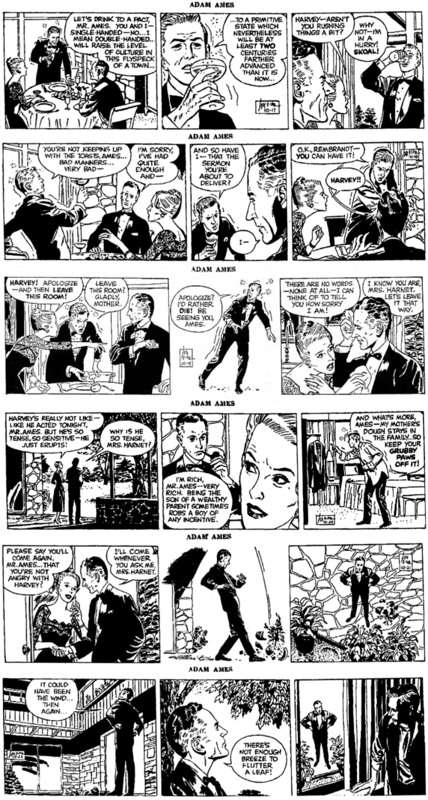 Two Sundays of Lou Fine's late fifties/early sixties soap opera strip Adam Ames. 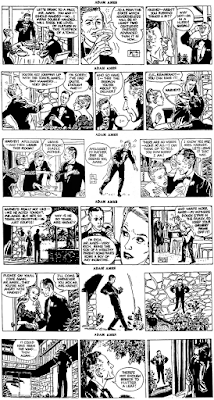 As you know, I am a huge fan of Fine's 'slick' style and have show much of his advertising work of the fifties, as well as runs of his later strips, including indeed Adam Ames. 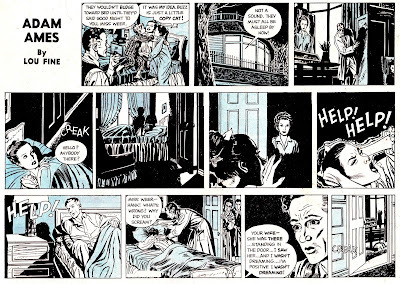 What I also mentioned there is that Adam Ames was a daily strip only. These two Sundays seemed to contradict that. So I went to the only source that knows it all, Alan Holtz' History Of American Newspaper Strips. And that confirmed my own findng, that Ames was indeed never a Sunday. So what happened. I found the 'answer' on Alan's blog, The Stripper's Guide. He had done a similar discoery (with even more pages, from which he sadly only showed one) and concluded that it must have been a reworking of the daily strip. In fact, for his sample, he also found the original dailies. So here is the whole lot: my two 'Sundays', Alan's sample and the daily week that went along with that. Let's end with showing an announcment for Lou Fine's other stripo from the sixties, Peter Scratch. Those who like that should follow the link to my short run of Scratcj Sundays. Fantastic find! The excellent structural continuity (art and writing) of Adam Ames appears even more obvious in these constructed "Sunday pages." 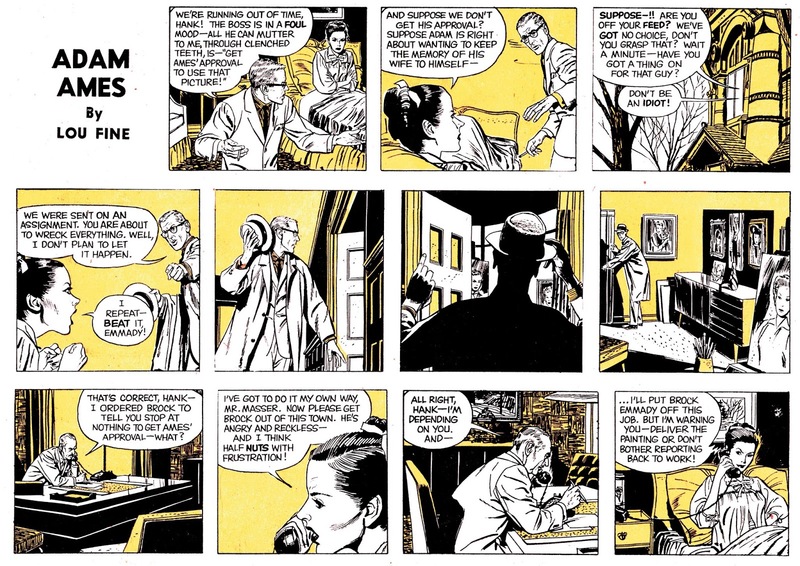 Granted, for various reasons, the "illustrative" styles of strips like Adam Ames, Secret Agent Corrigan and Rip Kirby were more amenable to the black and white format, still it would have been nice to see colour Sundays. 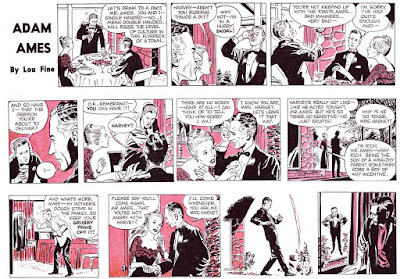 However, Is there any particular reason why well-illustrated "soaper" strips like On Stage, Apartment 3-G, Mary Worth and The Heart of Juliet Jones, had colour Sundays (Adam Ames being an interesting exception), but many adventure strips like Corrigan, Kirby, and even James Bond, (although not all, especially long-established space-fantasy strips like Flash Gordon, Buck Rogers, Phantom and Mandrake) did not? Various reasons, I guess. Rip kirby seems to have been the artist's choice. Maybe he preferred black and white or he just didn't want to get an assistant to get all that work done. Remember, when he did Flash Gordon he did not do the daily. 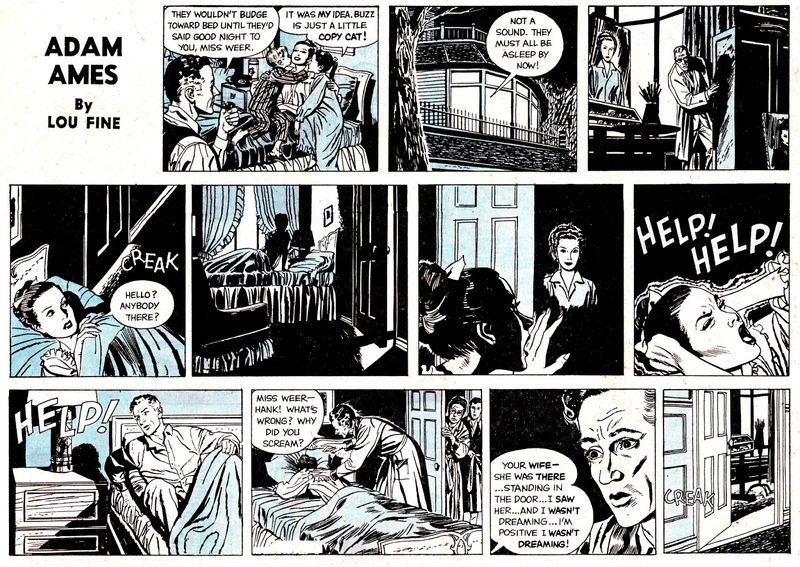 Secret Agent X9 may have been similar situation, with the addition that Mel Graff never did color Sundays (except for the few comic strip ads he did - and there was never wrong with the color in those - which you can see on my blog under Graff). James Bond was a British strip and they don't do Sundays. And Adam Ames probably was with a small syndicate. 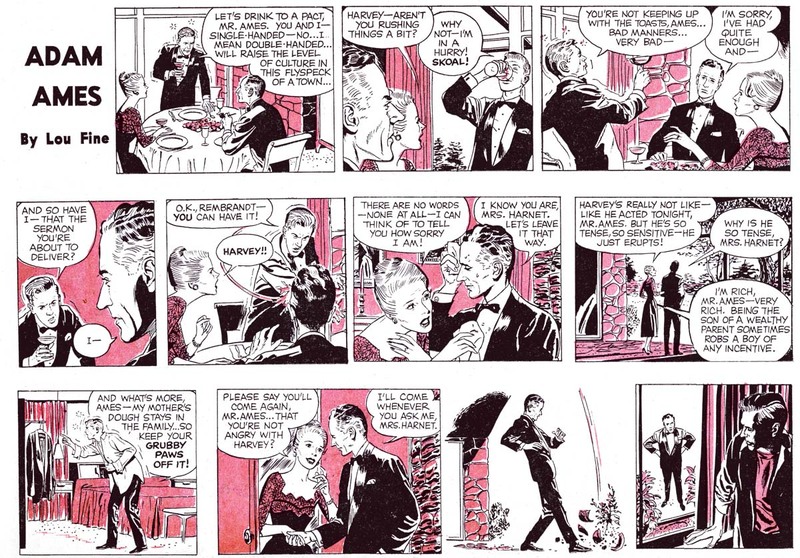 Another interesting strip in that regard was Scorchy Smith, which had a Sunday under A.C. Hollingsworth in 1954 and under George Tuska in 1955 and 1956, which was discontinued after that, probably because of poor sales. Excellent points - what that means is that there isn't necessarily a standard or simple reason why one strip featured Sundays and another didn't - your knowledge of the artists and circumstances behind the strips helps explain them on a case-by-case basis. The reminder that James Bond originated Britain, contrasts with another "British" hero, Simon Templar (the "Saint" featured in your blog) which did have a Sunday page - one main reason being it was American. But the Saint strip was made in the US. I don't know about the British origins of the Saint as a character. 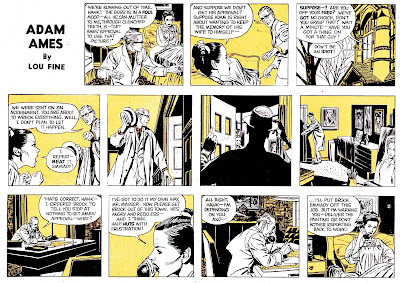 I only know Charteris had previously written Secret Agent X9 for Alex Raymond as a ghost writer for Raymond Chandler (or so I think). So my guess is Charteris was an ex-brit who came over even before WWII. After checking I see I was right. Wikipedia calls him British/American. Born in Singapore, studied in Cambridge, sold the first Saint in 1928 and moved to Hollywood in 1932. I ddn't know that. By the way, I hate the beard.